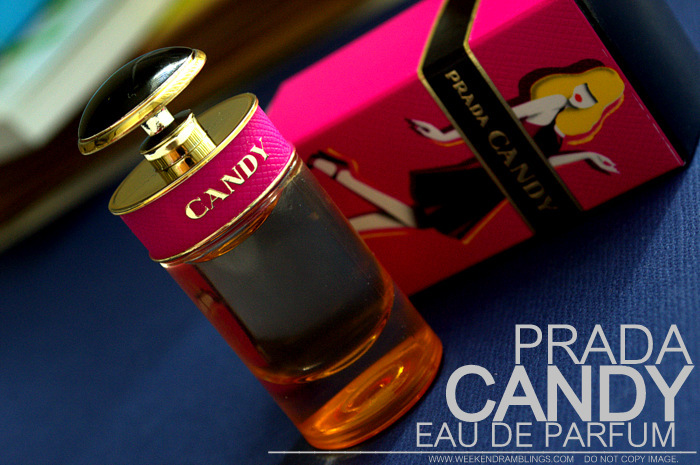 Prada Candy Eau de Parfum - Candy is the new feminine fragrance of Prada. It enriches the Prada Fragrance universe with another vision of the brand: colorful, pop and explosive. Prada Candy incarnates the new Prada woman: she's daring, sensual, full of life. The perfume is named after the seductive and joyful girl who is running wild. 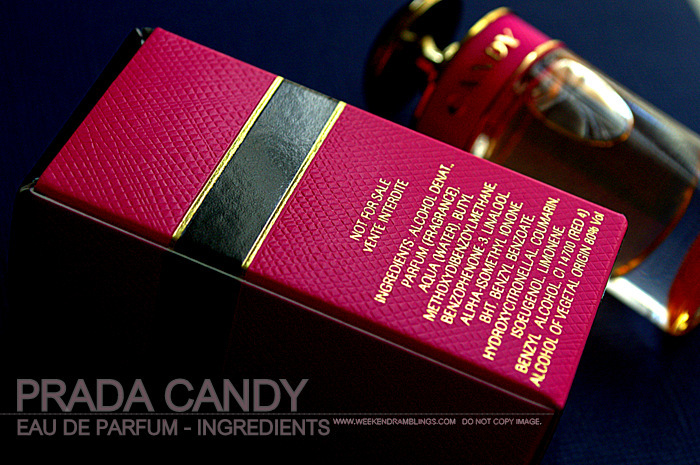 The new Prada Candy Eau de Parfum is another of the freebies-from-Sephora perfumes that I have. A vanilla-scented perfume that comes in bright pink packaging, I doubt if I would have bothered picking this up on my own. Since this is a deluxe-sampler version, it doesn't have a spray. The original version, though, is a spray, and from what I have read in the reviews, the cap doesn't come off - the cap is just designed to look one and is the actual spray nozzle for the perfume - so don't try taking it off! Top Notes: Regressive notes of joyful carefreeness, explosion of caramel. Middle Notes: Powdery notes of sophistication, cocktail of musks. Base Notes: Vanilla, benzoin overdose. The first whiff I took of the Prada Candy, all I could think of was there couldn't be a more suitable name for this perfume - the fragrance opens with an overwhelming sweetness! On my skin, though, this is most definitely a warm, caramel-vanilla scent with a powdery muskiness to it as the smell settles. This is definitely for those who like sweet, vanilla-scented perfumes, but it has a bit of lightness and warmth to it that stops it from being cloyingly sweet. The big plus point for me - the fragrance stays on a really long time on my skin. 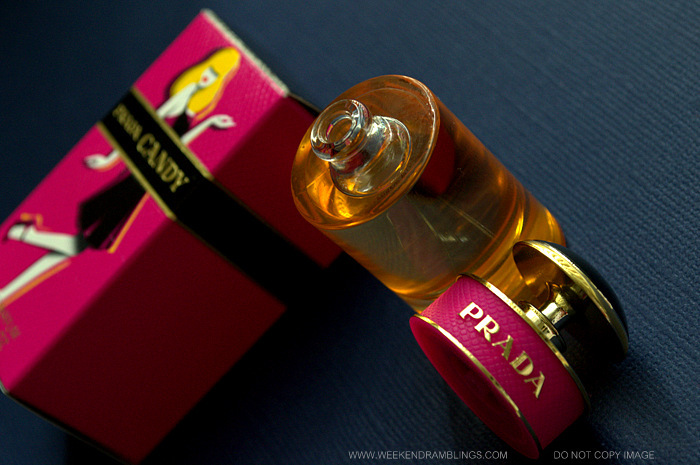 Overall, I would pick the Prada Candy Eau de Parfum for someone younger and/or people who love sweeter smells - and a perfect fragrance to wear during the cooler fall months. Hmm..do give it a try in store, Ritu. It's not terribly sweet on my skin - in the bottle initially it felt a little too sweet. Don't twist the cap off the way I have shown in the photo..the original/regular versions have the nozzle built into the cap! Am digging the packaging..but not a fan of sweet prefumes..btw how do you get such deluxe samplers with full packaging as freebie from sephora..:D..I always get these teeny tiny vials..